Relations between China and the United States have been of central importance to both countries over the past half-century, as well as to all states affected by that relationship—Taiwan and the Soviet Union foremost among them. Only recently, however, has the opening of archives made it possible to research this history dispassionately. 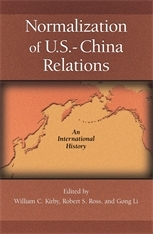 The eight chapters in this volume offer the first multinational, multi-archival review of the history of Chinese–American conflict and cooperation in the 1970s. On the Chinese side, normalization of relations was instrumental to Beijing’s effort to enhance its security vis-à-vis the Soviet Union and was seen as a tactical necessity to promote Chinese military and economic interests. The United States was equally motivated by national security concerns. In the wake of Vietnam, policymakers saw normalization as a means of forestalling Soviet power. As the essays in this volume show, normalization was far from a foregone conclusion.